I want first to say that I am very glad that I belong to the Campbells even if it is only forty‑secondly. I still feel a pride in the fact. I was never more thrilled in my life than the one time I met with you all there in Nelson and realized that all the good looking people around the tables were my relations. You people who have been able to meet year after year in that way have no idea what these letters mean to us, who are so far away and I think Cousin Will is doing a fine thing in keeping up the family love and pride by these letters. I was a very small girl when we left Nelson for Brainerd, Minnesota, which was then the far West, as I know my poor Mother felt then, but some of the impressions made before that on my childish mind have always remained. My dear Grandmother, "Aunt Sally", as every one else called her, has always seemed a very real person to me, and I can see her yet, getting ready for church, putting a few peppermints in her pocket for me and a few cloves for herself; then the lovely walk down the road and through the old covered bridge, and then the visits among the relatives and friends. Reading over these letters has seemed almost like some of those visits where each one was mentioned and their joys and sorrows stared. I often wonder if we are not missing a great deal by not having more of these friendly visits. We of the West at least seem always in a hurry and must have something doing all the time. The West is beautiful and I am sure there could never be any other home for me now. 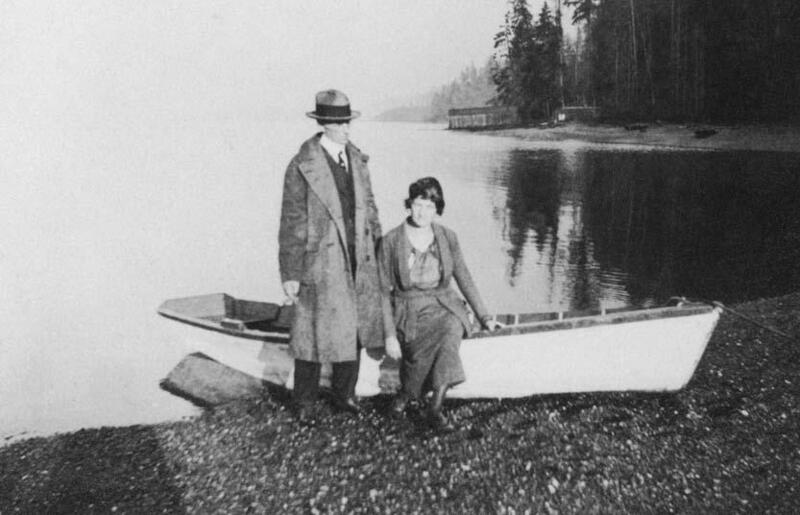 Our place which we have named "Firmond" is just about an hour's ride by ferry from Seattle, where my husband is employed in the Alaska Steamship Company offices, and where, by the way, we have a fine market for all our produce, said produce being mostly flowers. Our gardens today are still ablaze of color and I am sending in baskets of flowers every day. Roses are in bloom all down the path to the front gate while beyond the gate stretch the blue waters of Puget Sound. In the distance on the left are the snow capped Olympics and on the right the Cascades with old Mt. Ranier in their midst. Do you wonder we love it even in the rainy weather? We have had a very busy summer and many times have picked as many as two hundred bunches of sweet peas a day. I can pick thirty five bunches an hour,‑ that means about twelve hundred stems. The stems are about eight or ten inches long and four or five blooms on a stem, and the vines grow nine or ten feet high. I wonder if they grow like that in the East. Our greatest trouble, as I suppose it is with you, is to get help. I was so interested in Cousin Tommie's letter because they too are on the ocean beach. It must be lovely there. We take a little pleasure trip every now and then to Alaska which, by the way, I will say to all the Cousins is one of the finest trips in the world if one is not afraid of the water. So you see what in my childhood days was the "Far West" has become East to me; the prairies and lakes which I loved then have been supplanted by mountains and ocean. We do miss the relatives; there are none of our own family here except our immediate family and I was delighted to know Cousin Kate's family were in Oregon. Come up some time. Perhaps some of you may come West some day and if you do, be sure to look up little old Harper and your country Cousins. Am sorry we had no pictures to send; will try to get some finished in time but if not will put them in the next letter. We will be more than glad to bear our portion of the expense attached to this Correspondence, and are looking forward to the next letter with great pleasure. Copyright 2000, 2001, 2012 Tom Zurflieh and Wm. Thompson. Commercial use prohibited.